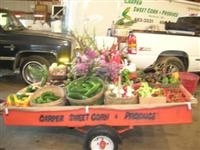 Welcome to the Carper Sweet Corn and Produce website. Our family operation strives to bring the freshest and quality produce items to our loyal customers. Our farm is located in eastern South Dakota near the small town of Rutland in Lake County. We have a cattle and grain operation in addition to our growing production of fresh produce. We put much effort into learning the best methods to produce a product with the best quality and value. Our customers are the reason our business has grown over the years. Growing vegetables is not an easy job, but the rewards are many. Our grandpa, who passed away in 2 002, remains a great inspiration. I thank my grandpa for instilling a sense of honor in working hard to reap the benefits of a job well done. Farming is more than a job; it is a lifestyle.